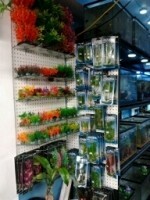 AquA AnimaniA » Aquariums » Aquarium Accessories » Make Your Aquarium a Show Stopper for Christmas! Make Your Aquarium a Show Stopper for Christmas! Make Your Aquarium a Show Stopper for Christmas or Liven Up Any Aquarium with Fantastic Gift Ideas! All Aquarium Decor, Ornaments and Plants –> 30% Off! This entry was posted in Aquarium Accessories, Aquariums, Coupondz, Door Crasher and tagged Aquarium Décor, Aquarium Ornaments, Aquarium Plants.